Before HP decides to call something “virtually indestructible,” they should send it out on a rock and roll tour first. HP, in conjunction with Arizona State University’s Flexible Display Center just announced a prototype of a computer screen – a very, very light computer screen – that’s supposed to just rock the display market. 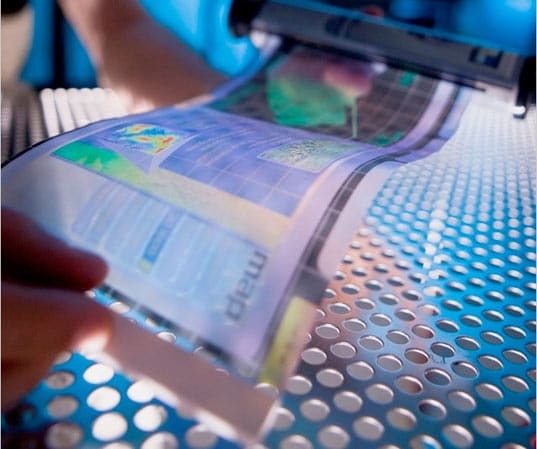 This stuff is manufactured similarly to the way that “thin film” photovoltaics are manufactured – a roll-to-roll process where the screens are pretty much printed onto “virtually indestructible” plastic sheets. They’re cheaper and more efficient than conventional screens according to Inhabitat, and they use up to 90% less material to produce.